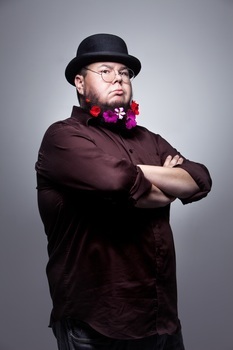 Shane Koyczan is not only a writer and spoken word virtuoso, but also a multi medium spoken word artist. His first published collection, Visiting Hours, was the only work of poetry selected by both the Guardian and the Globe and Mail for their Best Books of the Year lists in 2005. Destined to become a future classic, Visiting Hours is now in its third edition, and includes We Are More. The book remains in heavy demand and was the motivation for releasing Shane’s entire written catalogue in EBook formats. Koyczan followed up on the success of Visiting Hours with Stickboy, a novel in verse that chronicles the dark and lonely journey of a bullied child gripped by helpless rage. Koyczan shines a light into the bleak world behind some of the most incomprehensible acts in our culture, and also shows the healing power of love. Written for anyone who has ever been a child, Stickboy continues to be hailed by teachers, academics, and mental health experts alike for its deft handling of the subject of bullying. Shane returned to his roots with a collection of poetry titled, Our Deathbeds will be Thirsty, which was released in 2012. This book features the piece, To This Day, a poem about bullying that was made into a video by collaborating animators. That video, released in 2013, quickly received worldwide recognition by going viral on Youtube, receiving over a million views in a matter of days. It was released as a project to acknowledge and support national Anti-Bullying day. Since the videos release Shane has presented at TED Talks, where the audience leapt to their feet in applause. Sir Ken Robinson has listed that talk as one of his top ten talks on education. That TED Talk lead to him collaborating with TEDED to create a classroom tool that provides teachers a way to discuss anti-bullying with students. Now this extraordinary work has been adapted into an equally moving and visually arresting book. Thirty international artists, as diverse as they are talented, were inspired to create exceptional art to accompany “To This Day.” Each page is a vibrant collage of images, colors and words that resonate powerfully with anyone who has experienced bullying themselves, whether as a victim, observer, or participant. September 2014 — Shane’s latest and highly anticipated release, “Silence Is A Song I Know All The Words To” is his first graphic novel. Encapsulating incredible imagery illustrated by Gareth Gaudin, Shane once again covers many beautiful and thought provoking pieces relevant to our time. “Troll” a poem about cyber-bullying and the challenges of managing and understanding this new breed of abuse by critically examining the deep and hurtful wounds of participating in this digital generation. “Silence Is A Song” graphic novel is accompanied by a collection of songs of the poems featured in the novel, an astonishing musical collaboration with Cayne McKenzie of We Are The City and Hannah Epperson. It was produced by McKenzie, Epperson and Koyczan; mixed by Aiden Knight, and mastered by Brock McFarlane (Hey Ocean, Marianas Trench, Hedley). The assembly of songs creates a dimension to Shane’s message that is carried through into the amazing visual art in the graphic novel and further into the video collection that will accompany this incredible body of work. Shane takes us from the page and further displays his talents as a multi medium spoken work artist in his latest collaboration with the Vancouver Opera on his novel in verse “Stickboy.” Shane takes on a new challenge as a first time Librettist as he transforms his work into the operatic drama, which will premiere at Vancouver’s Playhouse Theatre this October. "Homer must have sounded [like this]…or Ginsberg or Kerouac."